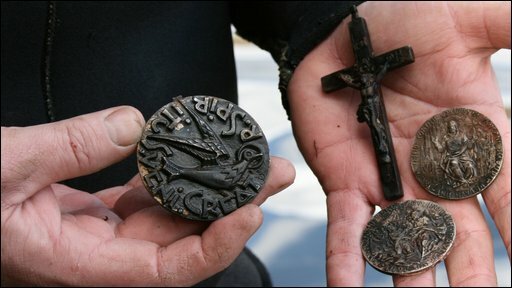 Precious artefacts given to a former Archbishop of Canterbury have been found apparently thrown into the River Wear at Durham. Individual items, including gifts from Pope Paul VI and other religious leaders, could be worth up to £10,000. The former Bishop of Durham Michael Ramsey lived in the city after retiring as Archbishop in 1974. He died in 1988. The objects, some solid gold, were discovered by brothers Gary and Trevor Bankhead while diving in the river. The first artefact - a silver trowel presented to the Archbishop for laying the foundation stone of an Indian church in 1961 - was found two years ago. Since then, the brothers have uncovered more than 30 finds linked to Mr Ramsey, along with hundreds of medieval and Saxon artefacts. It is not known how Mr Ramsey's belongings came to be in the river, but there is no record of his former home, on South Bailey, being burgled. Other items discovered include a solid silver coin from the Greek Orthodox Church and a solid gold coin from the leader of the Buddhist faith in Japan. 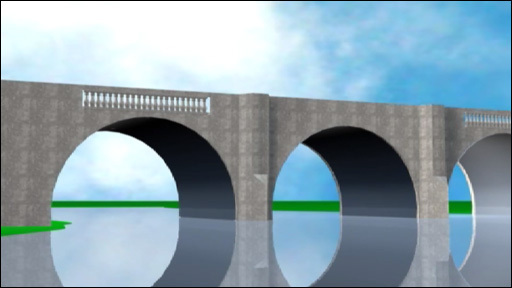 The brothers said they believed they were thrown from the city's Prebends Bridge. They have made 300 dives and said there were no further objects left in the river. Trevor Bankhead said: "Having done a bit of research over the three years, I think they were strategically positioned in the river from the positions we found them - at six different locations. "At those locations they could have only been put in deliberately." The brothers believe the former Archbishop threw the items in the river as a "gift" to the people of Durham. Anne Heywood, chapter steward at Durham Cathedral, said it would be speculation to say the Right Reverend Ramsey was responsible. She added: "We don't know whether he might have had a burglary. "Somebody might have thought these were worth something, and discovered when they were running across Prebends Bridge that they weren't, and just threw them in the river, but again that is just pure speculation." 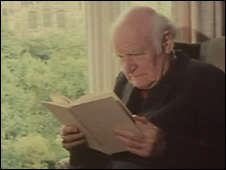 Mark McIntosh, professor of divinity at Durham University, who was a student of Mr Ramsey, said the former Archbishop's health declined in his later years. He said: "My hunch would be that he would have had very little knowledge of where most of his things were at that point in his life as he was growing feebler by the day." The value of the items, once established, will be split between the cathedral and the brothers. It is hoped some will eventually go on display at the 11th Century cathedral.